cords will soon be phased out. It’s a minor inconvenience, but I can never seem to figure out which side of the USB cord is “up.” It’s easy in the light of day, maybe, but at night it feels like I’m literally making stabs in the dark. Still, I’ll be thankful when the problem finally disappears for good next year with the coming of a new, slimmer USB port design. The newly designed connector, termed “Type-C,” is reversible, in that it will work in any orientation you plug it in. It's also approximately the same size as a Micro USB plug. "Intel is excited to see the development of the new thin Type-C connector as it will enable an entirely new super thin class of devices from phones to tablets, to 2-in-1s, to laptops to desktops and a multitude of other more specific usage devices,” explained Alex Peleg, Vice President, Platform Engineering Group. "This new industry standards-based thin connector delivering data, power and video is the only connector one will need across all devices. You won’t need to worry about your USB accessories getting obsolete too soon. 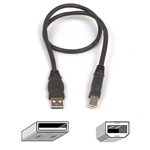 The USB 3.0 Promoter Group says the design of the new USB Type-C connector (PDF) won’t be finished until the middle of 2014 at the earliest. And even after, inexpensive adapters will help bridge the gap between new and old.